Bridget and Bear: Where did February (and March) go? Where did February (and March) go? Well I am not sure where the time has gone. February flew right on by. I always think of topics to write about, but then I get home and get busy on some project OR get busy laying on the couch. It's really one or the other. One big project I worked on was hostess gifts for all the showers I had in February and March. I found an idea on pinterest for making modge podge picture frames and kinda put my own spin on it too (of course). So during the week I mainly shopped for that stuff or worked on painting or modge podge-ing the scrapbook paper on the frames. I meant to take pictures, but sadly I never did! 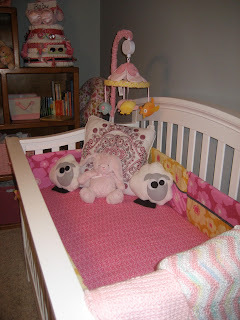 The other projects were preparing the nursery and the guest room to get some work done. We had them painted and new carpet put in. I really love how it turned out! And we were showered with many gifts and lots of love all month!!! So I guess that is where the time went. I tried to come up with a coherent post about it all, but I don't think that is possible now. Can you please remove my comment from your site? and the comment's name is "House Paint Colors Guide". I just found out that my account was compromised and someone left hundreds of comments all over the web on different sites without my awareness of the fact (black SEO/competitors). Google has notified me and now I'm trying to get all those comments removed because they are hurting my site. I will really appreciate if you take a minute to remove my comment from your site, and I thank you very much in advance.